Mr. Doohan earned the nickname ‘‘the Becker Wrecker’’ by stunning the defending champion, Boris Becker, in 1987. Mr. Doohan, then 26, was ranked No. 70 and hadn’t won a Wimbledon match until he stumbled past 123rd-ranked Alex Antonitsch in the first round in 1987. But he earned the nickname ‘‘the Becker Wrecker’’ by stunning the defending champion, Boris Becker, 7-6 (7-4), 4-6, 6-2, 6-4. His victory was considered one of the biggest upsets in the storied tournament’s history. Mr. Doohan, who was diagnosed nine weeks ago with a particularly aggressive form of what is known as Lou Gehrig’s disease, died Saturday, Tennis Australia said in a statement. He was 56. 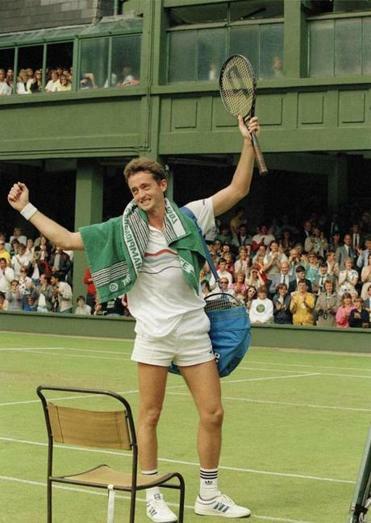 An Australian who played at the University of Arkansas, Mr. Doohan advanced the fourth round at Wimbledon in 1987, his best run at the tournament. At Arkansas, Mr. Doohan was an All-American and won an NCAA doubles title. As a pro, he reached No. 15 in doubles and won five titles. But he will be best remembered for his victory over Becker at Wimbledon. Mr. Doohan knew the odds he faced that day were long. He leaves his mother, two sons, and two sisters.